You will find below the horoscope of Annette Obrestad with her interactive chart, an excerpt of her astrological portrait and her planetary dominants. If you know the time of birth of Annette Obrestad, we would appreciate it if you would send us your information with your source, at stars@astrotheme.com. To thank you for contributing to the enhancement of our astrological database, we shall be glad to send you the astrological portrait (34 pages) of this celebrity. Horoscopes having the same aspect Sun square Saturn (orb 0°31'): Emma Watson, Oprah Winfrey, Charles Manson, Joseph Stalin, Salvador Dalí, George Harrison, Jane Fonda, Lenny Kravitz, Fidel Castro, Arnaud Montebourg, Malala Yousafzai, Billie Joe Armstrong... Find all the celebrities having this aspect. Celebrities clicked on in real-time: 576,771,230 times. Annette Obrestad (born September 18, 1988 in Sandnes) is a Norwegian poker player. Obrestad is the youngest person to ever win a World Series of Poker Europe (WSOPE) bracelet. Obrestad is part of the Full Tilt Poker team and plays under the username Annette_15. Annette Obrestad started her poker career online when she was only fifteen years old using the online screen-name "Annette_15." She claims she never had to deposit money on any online poker site. Instead she made her initial online bankroll by winning freeroll poker tournaments from which she went on to amass several hundred thousand dollars in winnings. Here are some character traits from Annette Obrestad's birth chart. This description is far from being comprehensive but it can shed light on his/her personality, which is still interesting for professional astrologers or astrology lovers. 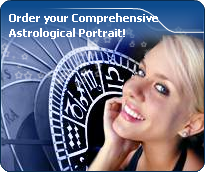 In a matter of minutes, you can get at your email address your astrological portrait (approximately 32 pages), a much more comprehensive report than this portrait of Annette Obrestad. Warning: when the birth time is unknown, which is the case for Annette Obrestad, a few paragraphs become irrelevant; distributions in hemispheres and quadrants are meaningless, so are dominant houses and houses' accentuations. Therefore, some chapters are removed from this part. Annette Obrestad, Fire is dominant in your natal chart and endows you with intuition, energy, courage, self-confidence, and enthusiasm! You are inclined to be passionate, you assert your willpower, you move forward, and come hell or high water, you achieve your dreams and your goals. The relative weakness of this element is the difficulty to step back or a kind of boldness that may prompt you to do foolish things. Like the majority of Earth signs, Annette Obrestad, you are efficient, concrete and not too emotional. What matters to you is what you see: you judge the tree by its fruits. Your ideas keep changing, words disappear, but actions and their consequences are visible and remain. Express your sensitivity, even if it means revealing your vulnerability. Emotions, energy and communication must not be neglected; concrete action is meaningless if it is not justified by your heart, your intellect or your enthusiasm. The Mutable mode is the most emphasized one in your natal chart, Annette Obrestad, which indicates a mobile character that is curious and thirsty for new experiences and evolution. You are lively and flexible, and you like to react quickly to solicitations, but don't confuse mobility with agitation, since this is the danger with this configuration - and with you, stagnation is out of the question. Security doesn't matter as long as you are not bored. You optimize, you change things, you change yourself... all this in a speedy way. After this paragraph about dominant planets, of Annette Obrestad, here are the character traits that you must read more carefully than the previous texts since they are very specific: the texts about dominant planets only give background information about the personality and remain quite general: they emphasize or, on the contrary, mitigate different particularities or facets of a personality. A human being is a complex whole and only bodies of texts can attempt to successfully figure out all the finer points. Your nature is optimistic and emotional, Annette Obrestad, and you are caught up in two incompatible longings: you are fond of exoticism and independence of movement, but at the same time, you feel comfortable in a form of middle-class attitude and conformism; in general, it translates into a succession of moods, now quiet and well adapted to the situations you experience, now marked by an irresistible desire for change and revival. You have a good and naïve nature, with a lot of self-confidence. Your emotionalism prompts you to live intensely a variety of numerous emotional experiences, a bit scattered, but with all the stimulations you need to be a balanced person. Your pleasant and welcoming attitude wins you some degree of popularity, all the more so because, despite your thirst for adventures that may scare away some people, you adjust to your environment's customs so easily. You are so proud and generous, Annette Obrestad, that the power of your love contains in itself your vulnerability. However, this is precisely what makes you charming and original. You are loyal and straightforward and you need to love as much as you need to be loved. Both feelings are tightly linked and there is a real danger that love is broken up by trivial misunderstandings, just because your touchiness is affected. You are demonstrative, brilliant, and even dramatic, with a legendary generosity. For you, everything is, or must be, excessive: gestures of love towards your partner, your presents, your comfort and the luxury, which marks your outings and your travels. You are physically a lion, at least, you have its sexual appetite; you are voluptuous and passionate. Flexibility is the only thing that is out of your reach, in the ways you show your love, as well as in your responses to annoying events. Impulsive, impatient, quick and energetic? You? Yes of course, Annette Obrestad. You are courageous and able to make intense and huge efforts for a short while; and what a terrific rhythm! In sport, of course, or in your sexuality, you are not the type who ponders, you take action instinctively, “in a rough and ready way”. You are outspoken, you do not worry about other people's opinion and you do not allow them to slow you down or to judge you. You must succeed or fall apart. You cannot be bothered with diplomacy or with compromises. You are too straightforward and unyielding to waste time with finesse or shrewdness. This is what makes you charming because, with you, one always knows where one stands. This text is only an excerpt from of Annette Obrestad's portrait. We hope that it will arouse your curiosity, and that it will prompt you to deepen your knowledge of astrology, as well as to visit and use the wide range of free applications at www.astrotheme.com.